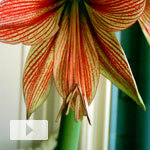 You may know Amaryllis as those frilly flowers that keep us company in winter, but you’ve never seen anything like Amaryllis Chico. Its slender petals and mixed colors make it look like an alien. As soon as I saw one online, I knew I had to try it. 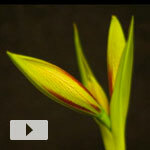 Once the bud started rising, I set the PlantCam on it to watch the progress. 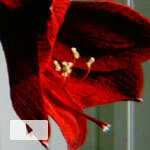 Here it is – over a month of growth compressed into under a minute, with the strangest Amaryllis bloom you’ll ever see at the end. Side story: When I bought mine, I got two more and sent them to out-of-town family. It was so nice to know that the same weirdness that was growing in my house was also growing in theirs. I may make a tradition out of sending bulbs as gifts while growing them myself. It’s a wonderful way to experience the joy of plants in real time with far-flung loved ones. After a couple weeks of working on the flower spike, this Amaryllis (Hippeastrum "Exotic Star") opened up its first bloom in just two days.